Pezzottaite, ideally Cs(Be2Li)Al2Si6O18, is a new gem mineral that is the Cs,Li-rich member of the beryl group. It was discovered in November 2002 in a granitic pegmatite near Ambatovita in central Madagascar. Only a few dozen kilograms of gem rough were produced, and the deposit appears nearly exhausted. 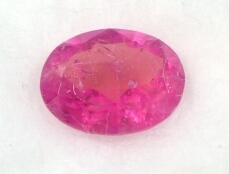 The limited amount of transparent faceted stones and cat's-eye cabochons that have been cut usualy show a deep purplish pink color. 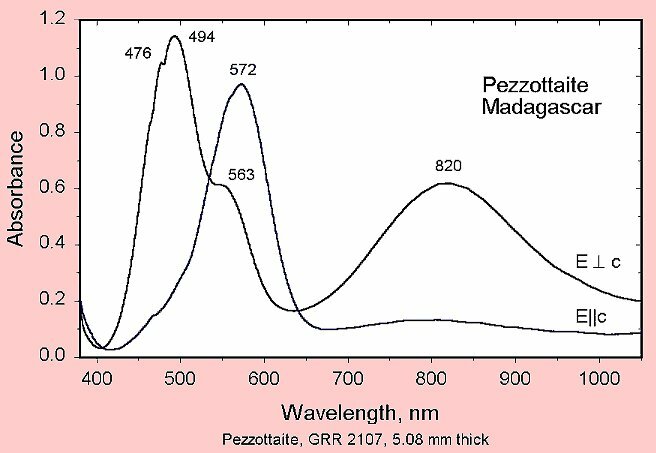 Pezzottaite is distinguished from beryl by its higher refractive indices (no=1.615-1.619 and ne=1.607-1.610) and specific gravity values (typically 3.09-3.11). In addition, the new mineral's infrared and Raman spectra, as well as its X-ray diffraction pattern are distinctive, while the visible spectrum recorded with the spectrophotometer is similar to that of morganite. The color is probably caused by radiation-induced color centers involving Mn3+.